^ Quinlan, David. The Illustrated Guide to Film Directors. Rowman & Littlefield. 1983. ISBN 0-389-20408-0. pp. 78. 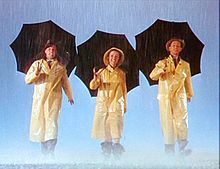 ^ Singin' in the Rain Movie Reviews, Pictures, Trailers. Rotten Tomatoes. [2013-05-04]. ^ 5.00 5.01 5.02 5.03 5.04 5.05 5.06 5.07 5.08 5.09 5.10 5.11 5.12 5.13 5.14 5.15 5.16 5.17 5.18 5.19 5.20 5.21 5.22 5.23 5.24 5.25 5.26 5.27 5.28 5.29 5.30 5.31 5.32 5.33 5.34 5.35 5.36 5.37 5.38 5.39 5.40 5.41 5.42 5.43 5.44 5.45 5.46 5.47 5.48 5.49 Wakeman, John. World Film Directors, Volume 2. The H. W. Wilson Company. 1988: 273–282. ISBN 0-8242-0763-7. ^ 6.000 6.001 6.002 6.003 6.004 6.005 6.006 6.007 6.008 6.009 6.010 6.011 6.012 6.013 6.014 6.015 6.016 6.017 6.018 6.019 6.020 6.021 6.022 6.023 6.024 6.025 6.026 6.027 6.028 6.029 6.030 6.031 6.032 6.033 6.034 6.035 6.036 6.037 6.038 6.039 6.040 6.041 6.042 6.043 6.044 6.045 6.046 6.047 6.048 6.049 6.050 6.051 6.052 6.053 6.054 6.055 6.056 6.057 6.058 6.059 6.060 6.061 6.062 6.063 6.064 6.065 6.066 6.067 6.068 6.069 6.070 6.071 6.072 6.073 6.074 6.075 6.076 6.077 6.078 6.079 6.080 6.081 6.082 6.083 6.084 6.085 6.086 6.087 6.088 6.089 6.090 6.091 6.092 6.093 6.094 6.095 6.096 6.097 6.098 6.099 6.100 6.101 6.102 6.103 6.104 6.105 6.106 6.107 6.108 6.109 Silverman, Stephen M. Dancing on the Ceiling: Stanley Donen and His Movies. New York: Knopf. 1996. ISBN 0-679-41412-6. ^ 7.00 7.01 7.02 7.03 7.04 7.05 7.06 7.07 7.08 7.09 7.10 7.11 7.12 7.13 7.14 7.15 7.16 7.17 7.18 7.19 7.20 7.21 7.22 7.23 7.24 7.25 7.26 7.27 7.28 7.29 7.30 7.31 7.32 7.33 7.34 7.35 Casper, Joseph A. Stanley Donen. Scarecrow Press. 1983. ISBN 0-8108-1615-6. ^ Visual History with Stanley Donen. [2013-11-13]. （原始内容存档于2013-10-15）. ^ Morley, Sheridan; Leon, Ruth. Gene Kelly: A Celebration. Pavilion Books Ltd. 1996: 88. ISBN 978-1-85793-848-7. ^ 10.0 10.1 10.2 10.3 10.4 Hirschhorn, Clive. Gene Kelly: a Biography. W.H. Allen. 1984. ISBN 0-491-03182-3. ^ MacFarlane, Seth. Family Guy season 5 DVD commentary for the episode "Road to Rupert" (DVD). 20th Century Fox. 2007. ^ 12.0 12.1 12.2 Out to Lunch with Stanley Donen. Vanity Fair. 2013-02-22 [2013-03-03]. ^ Kelly, Gene. Dialouge on Film. American Film 4, #4 (1979-2) pp. 37. ^ 14.00 14.01 14.02 14.03 14.04 14.05 14.06 14.07 14.08 14.09 14.10 14.11 14.12 14.13 14.14 14.15 14.16 14.17 Hess, Earl J.; Dabholkar, Pratibha. Singin' in the Rain: The Making of an American Masterpiece. University Press of Kansas. 2009. ISBN 0-7006-1656-X. ^ Stanley Donen: Master of the Movie Musical. ABC News. 2012-08-17 [2012-11-03]. ^ National Film Registry (National Film Preservation Board, Library of Congress) 互联网档案馆的存檔，存档日期2012-04-19. ^ The 27th Academy Awards (1955) Nominees and Winners. oscars.org. Academy of Motion Picture Arts and Sciences. [2013-11-13]. （原始内容存档于2011-07-06）. ^ Kismet (1955). tcm.com. [2013-11-13]. （原始内容存档于2012-01-26）. 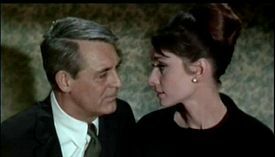 ^ Charade (1963). [2013-11-13]. （原始内容存档于2013-10-25）. ^ The 40th Academy Awards (1968) Nominees and Winners. oscars.org. Academy of Motion Picture Arts and Sciences. [2013-11-13]. （原始内容存档于2013-10-17）. ^ Bedazzled. Chicago Sun-Times (The Chicago Sun-Times). 1968-01-30 [2013-11-13]. （原始内容存档于2013-11-13）. ^ Bosom Buddies. New York Press. 2007-07-25 [2012-01-03]. （原始内容存档于2012-01-03）. ^ Lerner, Alan J. The Street Where I Live. London: Coronet Books. 1978: 242. ISBN 0-340-25453-X. ^ Exclusive Interview: The Last Crusade of Screenwriter Jeffrey Boam. assignmentx.com. 2000-02-11 [2013-05-03]. ^ The 70th Academy Awards (1998) Nominees and Winners. oscars.org. Academy of Motion Picture Arts and Sciences. [2013-11-13]. （原始内容存档于2013-10-19）. ^ Camille does the Oscars. Salon.com. [2013-11-13]. （原始内容存档于2012-07-25）. ^ 'LOVE LETTERS' COMES TO LIFE. New York Daily News. 1999-04-11 [2013-11-13]. （原始内容存档于2012-10-22）. ^ THEATER REVIEW; Is She a Serious Actress? XXXtremely. The New York Times. 2002-12-12 [2011-12-28]. ^ 30.0 30.1 Thomson, David. The New Biographical Dictionary of Film 5. Alfred A. Knopf. 2010: 274. ISBN 0-307-27174-9. ^ Director William Friedkin on Rising and Falling and Rising in the Film Industry. vulture.com. 2013-05-03 [2013-05-06]. ^ Stanley Donen to be honored at New York Israel Film Fest. New York Daily News. 2011-04-22 [2011-12-28]. ^ ‘Artist’ paints a glorious portrait of old Hollywood. The Boston Herald. 2011-12-23 [2011-12-28]. ^ "The Artist" Gets Thumbs Up from Hollywood Vets. showbiz411.com. 2011-11-18 [2011-12-28]. ^ Charness, Casey. Hollywood cine-dance: a description of the interrelationship of camerawork and choreography in films by Stanley Donen and Gene Kelly. New York University. 1977. ISBN 0632043792. ^ 36.00 36.01 36.02 36.03 36.04 36.05 36.06 36.07 36.08 36.09 36.10 36.11 36.12 36.13 36.14 36.15 36.16 36.17 36.18 36.19 Yudkoff, Alvin. Gene Kelly: A Life of Dance and Dreams. Back Stage Books. 1999. ISBN 0-8230-8813-8. ^ 37.0 37.1 37.2 Blair, Betsy. The Memory of All That. Alfred A. Knopf. 2003. ISBN 0-375-41299-9. ^ Riverside Theatre's WHAT A GLORIOUS FEELING Opens 10/30. broadwayworld.com. 2012-10-12 [2012-11-03]. ^ What A Glorious Feeling. 2012-10-30 [2012-11-03]. （原始内容存档于2012-09-22）. ^ Like his films, Donen exudes style and wit. Boston Globe. 2009-10-04 [2011-12-28]. ^ Prizes & Honours 1956. Berlin International Film Festival. [2012-01-05]. ^ Gene Kelly: Filmmaker Interview - Robert Trachtenberg. PBS.org. 2006-06-08 [2011-12-28]. ^ Chaplin, Saul. The Golden Age of Movie Musicals and Me. University of Oklahoma Press. 1994. ISBN 0-8061-2652-3. pp. 59. ^ Box Office Information for Hello, Dolly!. The Numbers. Nash Information Services. [2012-02-26]. （原始内容存档于2012-10-18）. ^ LoBianco, Lorraine. Hello, Dolly! (1969) – Articles. TCM database. Turner Classic Movies. [2013-04-07]. ^ Wagner, Robert. Pieces of My Heart – A Life. New York: Harper Collins. 2008. ISBN 0-06-137332-X. pp. 174. ^ Peter Donen. Variety. 2004-01-12 [2013-03-03]. ^ Joshua Donen. The New York Times. [2011-12-28]. ^ Mark Donen. The New York Times. [2011-12-28]. ^ Out to Lunch with Stanley Donen. Vanity Fair. 2013-02-22 [2013-03-03]. ^ The One, the Only Stanley Donen. Lincoln Center for the Performing Arts. [2011-12-28]. ^ 2009 Astaire Awards Are Presented. theatermania.com. 2009-06-01 [2012-04-02]. ^ Legendary Musicals Director Stanley Donen On Audrey Hepburn and 'Dancing With The Stars' (Q&A). The Hollywood Reporter. 2012-06-22 [2013-03-09]. ^ Stanley Donen, You Just Do It. Wichita Films. [2011-12-28]. （原始内容存档于2012-04-26）. ^ Byrge, Duane; Barnes, Mike. Stanley Donen, Famed Director of Mirthful Movie Musicals, Dies at 94. The Hollywood Reporter. 2019-02-23 [2019-02-23]. Blair, Betsy. The Memory of All That. Alfred A. Knopf. 2003. ISBN 0-375-41299-9. Casper, Joseph A. Stanley Donen. Scarecrow Press. 1983. ISBN 0-8108-1615-6. Charness, Casey. Hollywood cine-dance: a description of the interrelationship of camerawork and choreography in films by Stanley Donen and Gene Kelly. New York University. 1977. ISBN 0632043792. Hess, Earl J.; Dabholkar, Pratibha. Singin' in the Rain: The Making of an American Masterpiece. University Press of Kansas. 2009. ISBN 0-7006-1656-X. Hirschhorn, Clive. Gene Kelly: a Biography. W.H. Allen. 1984. ISBN 0-491-03182-3. Silverman, Stephen M. Dancing on the Ceiling: Stanley Donen and His Movies. New York: Knopf. 1996. ISBN 0-679-41412-6. Thomson, David. The New Biographical Dictionary of Film 5. Alfred A. Knopf. 2010. ISBN 0-307-27174-9. Wakeman, John. World Film Directors, Volume 2. The H. W. Wilson Company. 1988: 273–282. ISBN 0-8242-0763-7. Yudkoff, Alvin. Gene Kelly: A Life of Dance and Dreams. Back Stage Books. 1999. ISBN 0-8230-8813-8.